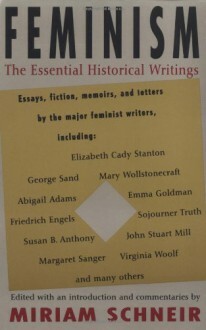 Here are the essential historical writings of feminism. Many of these works, long out of print or forgotten in what Miriam Schneir describes as a male-dominated literary tradition, are finally brought out of obscurity and into the light of contemporary analysis and criticism. Included are more than forty selections, coveting 150 years of writings on women's struggle for freedom -- from the American Revolution to the first decades of the twentieth century.This updated, wide-ranging collection encompasses the crucial issues of women's oppression. A surprising degree of continuity between the ideas of the old and the new feminism is evident throughout. In her selection, Miriam Schneir has by passed writings that deal exclusively with the outdated topic of suffrage in an effort to focus attention on the still unsolved feminist problems: marriage as an instrument of oppression; woman's desire to control her own body; the economic independence of women; the search for selfhood.This richly diverse collection contains excerpts from books, essays, speeches, documents, letters, as well as poetry, drama, and fiction. Extensive commentaries by the editor help the reader see the historical context of each selection.